ABSTRACT: Internal features of the smooth, traditionally nonmarine ostracode “Carbonitaâ€ altilis (Jones and Kirkby 1879) are reported in detail for the first time. Based on the 26-28 stigmata within the adductor muscle scar (AMS) field, a ridge and groove contact margin, and an adont hinge, we establish the new genus Velatomorpha. Included within this genus are taxa previously assigned to Carbonita,Healdia?, and Microcheilinella. The characters diagnosed for this new genus warrant placement in the SuborderMetacopina, Superfamily Healdioidea. The associated biota and sedimentary facies indicate that Velatomorpha lived in a mixed freshwater-marine (brackish) estuarine environment. 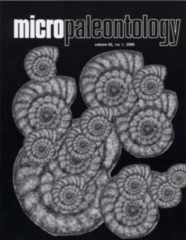 The implication of our taxonomic revision for Velatomorpha altilis underscores the necessity to carefully evaluate the internal features of smooth, podocopid and metacopine ostracodes reported from Paleozoic strata before making taxonomic assignments and generalized paleoecological inferences.